Phineas & Ferb Week at Kids' Hair! | Kids' Hair Inc.
← JDRF Month at Kids’ Hair! 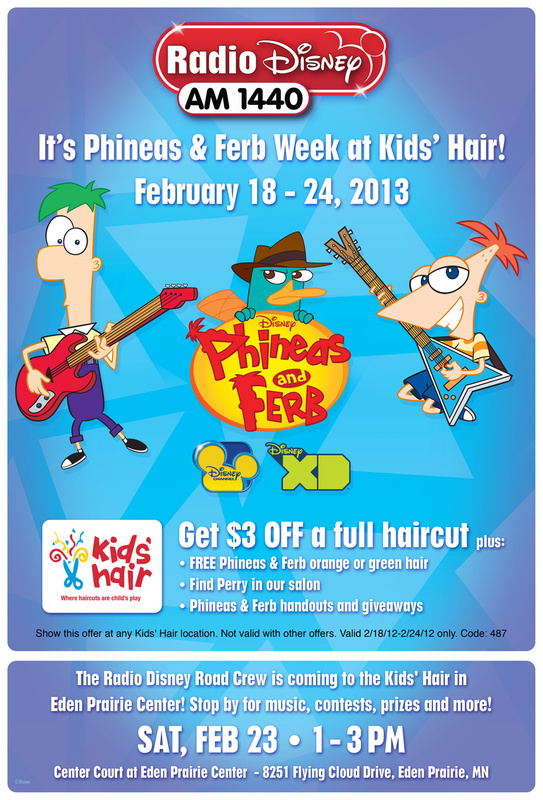 Phineas & Ferb Week at Kids’ Hair! Also, on Saturday, February 23, the Radio Disney Road Crew will be at the Eden Prairie Mall with Kids’ Hair for a Radio Disney Road Crew show! Stop by from 1-3pm for music, dancing, prizes and more. We will be in the lower center court, around the corner from the salon, near Von Maur. Visit Kids’ Hair February 18-24 for all this Phineas & Ferb fun!! This entry was posted in Community News & Events, Kids' Hair News, Kids' Haircut Specials. Bookmark the permalink.